Why is traffic safety important? Why is preventing falls among older adults important? Falls are the most common type of fatal unintentional injuries in Hawaii averaging over 108 each year. Falls are also the leading cause of nonfatal injuries in the state with nearly 21,000 emergency room visits and 2,700 hospitalizations each year. More than three quarters of the victims are aged 65 or older and the risk of fatal falls increases dramatically as seniors move into higher age ranges. The emotional and fiscal burden associated with fall injuries is significant. Multiple prescription medications can contribute to a fall if they interact and create dizziness. Vision can contribute to falling. Small changes in eyesight over a long period may be difficult to notice so yearly eye exams are vital. Hazards in the home can increase the risk of falling such as electric cords across pathways, slippery floors, and a lack of handrails and lighting on stairs. See A Home Fall Prevention Checklist for Older Adults brochure for more information. Poor physical strength or a loss of balance can contribute to risk for falling. Answer: Most falls are preventable no matter what your age is. Preventing falls means being more careful, being aware of your physical limitations and being equally aware of your surroundings. See What You Can Do To Prevent Falls brochure for more information. Q: What do I do in case of a fall? Answer: If you or a loved one has fallen and been injured, call 9-1-1 and get emergency help. If in doubt, do not wait. Call 9-1-1. Q: Where can I find information about fall prevention services? Answer: The Hawaii Fall Prevention Resource Guide is a comprehensive listing of fall prevention programs and resources in Hawaii. 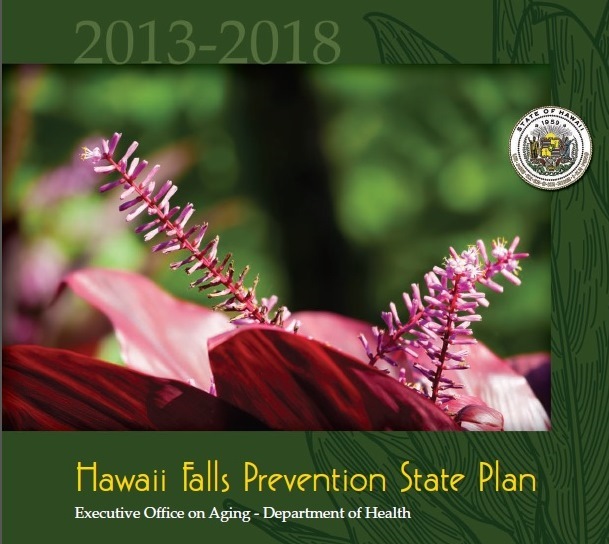 Designed for health care providers and individuals interested in learning about fall prevention, the Guide also includes facts about falls in Hawaii, the reasons people fall, and a list of additional online resources. Myth: Falls cannot be prevented, especially with aging. Fact: Falls are not inevitable even as you age. You are less likely to fall by staying active and participating in activities such as tai chi, hula, gardening, and walking around the mall or neighborhood. All of these kinds of activities help to maintain muscle tone and balance for preventing falls. Please refer to the updated data summary on falls 2008-2012 for more detail. For the full chapter on falls (PDF 656KB) refer to the Databook (Injuries in Hawaii 2007-2011). 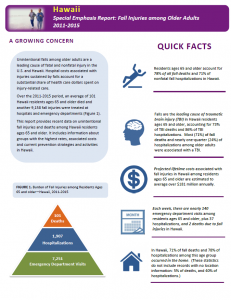 Please refer to the Overview of injuries among seniors in Hawaii (PDF 102KB) presentation to review the most updated data (2004-2013). In 2010, a statewide needs assessment (480 KB) was conducted that included a literature review, an online survey of more than 200 fall prevention professionals and community members, and follow-up telephone interviews with 58 key informants. The Hawai‘i State Department of Health, Injury Prevention and Control Section (IPCS), together with the Fall Prevention Consortium and other partners, used the results from this needs assessment as the basis for the following recommendations. For more detail, please refer to the Fall Prevention Recommendations in the 2012-2017 (PDF 617 KB) Hawaii Injury Prevention Plan (HIPP). The Plan outlines specific strategies for each of the fall prevention recommendations in HIPP that will be implemented by the Fall Prevention Consortium. The Plan was developed in 2012 by a short-term Fall Prevention Taskforce convened by the Executive Office on Aging with the support of the Department of Health’s Emergency Medical Services and Injury Prevention Systems Branch. In connection with the Hawaii Fire Department smoke detector inspection/installation program, new recruits were trained by IPCS and Project Dana to conduct a home safety assessment. Smoke detectors are installed during home visits to seniors and any fall related home hazards are identified and referred for follow-up services. Other program partners include Hilo Medical Center (HMC), Hawaii County Office on Aging and its Aging and Disability Resource Center (ADRC). This annual event is part of the National Fall Prevention Awareness week in September and promotes free medication reviews, free balance screening and fall prevention information through over 60 stores and businesses statewide. It is a joint partnership with Foodland Supermarkets, Times Supermarkets, Mina Pharmacies, and KTA Superstores. Mission: To prevent falls through networking, education, advocacy and resource development. The Hawaii Fall Prevention Consortium was formed in 2003 with support and leadership provided by Hawaii State Department of Health Injury Prevention and Control Section (DOH/IPCS). Its purpose is to provide organizations, professionals, caregivers, advocates and interested individuals involved in fall prevention the opportunity to network, share information and collaborate on projects that reduce the incidence and severity of fall injuries in our aging population. The consortium is in the process of implementing the State Plan for 2013-2018. Implementation of the plan requires extensive planning, development and fiscal support so the consortium has formed three committees on public awareness, increasing fall prevention programs and services, and engaging professional and community member in fall prevention activities. Each committee is lead by a chair and is tasked with implementing the strategies related to its specific issue. The Fall Prevention Consortium steering committee keeps track of the progress and status of the various projects, scheduling, and events required to implement the State Plan. All members of the Consortium and its committees are volunteers dedicated to reducing fall injuries. The Consortium works closely with IPCS and the Executive Office on Aging for coordination, technical assistance and funding support. In addition to its work towards implementation, the Consortium participates in the annual National Fall Prevention Awareness Day activities, hosts and supports various events during the year, and is planning the Hawaii State Fall Prevention Conference to be held in the fall of 2015. This year will be the fourth State Conference sponsored by the Consortium. Meeting time and location of the Fall Prevention Consortium: Queen’s Conference Center, Room 203, corner of Punchbowl and Beretania Streets, 5 times per year, normally on a Tuesday in January, March, May, August, and November from 10:00am-11:30am. Confirm actual date by contacting the Fall Prevention Coordinator listed below, as locations and times may change. This guide is for kupuna (seniors), their family members, health care professionals and others seeking information about resources to assist in preventing falls. The Resource Guide can be downloaded in PDF format or just scrolled through to read. The Resource Guide is a living document that can be enhanced. Contact Stan Michaels Stanley.Michaels@doh.hawaii.gov if you have a fall prevention-related company, service or resource that should be listed. Home Safety Checklist – Summary – is a brief summary of the CDC “Home Fall Prevention Checklist for Older Adults Brochure” brochure, which is an evidenced based document. We have taken the major points and listed simple steps an individual can take to make their loved ones home fall prevention safe.